If you were to offer me a Facebook page with 10,000 genuine fans or an email list of 1,000 people who want to hear from me, I would take the email list without hesitation. Even if you sweeten the deal by adding 1,000 Youtube subscribers and 10,000 Twitter followers, I’ll still take the email list. Update: This post has gone pretty viral with lots of others sharing similar horror stories. Click here if you want to see some of the updates. Update 2: Google personally reached out to me (!) and confirmed there was a Gmail bug. I’ve been slowly growing my newsletters in the marketing world for seven years, and view it as an honor that people want to read my updates in their inbox. That’s why it would be so crushing to have that taken away from me overnight, which is (partly) what happened recently. And not just to me. A recent Google change (from what I can tell) has hurt a lot of newsletter owners. Two weeks ago, after months of work, I finally got to share this new website of mine – Detailed.com – with the world. The aim of this blog is to help anyone with a website find proven content ideas that they can use to drive more traffic and links to their own sites. The concept is already working, with one recent article helping a reader get on the front page of Product Hunt. Only half of the people I send email updates to got to know about this new venture of mine, and that’s because my open rate has suddenly become atrocious. It dropped more than 50% overnight. For most of the people I contacted, my email announcing this new project of mine went into their spam folder in Gmail. The same happened with another email I sent a week later, on a different topic altogether, with my message landing in the spam folder of people who have been following (and replying to) my updates for years. This post is more than just detailing my struggles with email deliverability. I believe Google specifically changed ‘something’ in Gmail, and I have a number of examples to help make my case. I’m typically not too concerned with my open rate as I know it fluctuates, but having long-time readers no longer even getting the chance to open my emails is really frustrating. Fortunately some people do check their spam folder now and then, so emails like the following let me know something odd was going on. In around seven years of sending emails I’ve received the odd notice that an email I sent went to spam, but never so many at once, and never coinciding with such an awful open rate. I reached out to my primary email service provider, Aweber, to see if they had any advice to offer, but their reply was fairly generic. (To their credit, they probably receive many emails like mine from people just starting out and wondering why 100% of their audience didn’t read the email they sent out, so I can’t be too critical of their response). 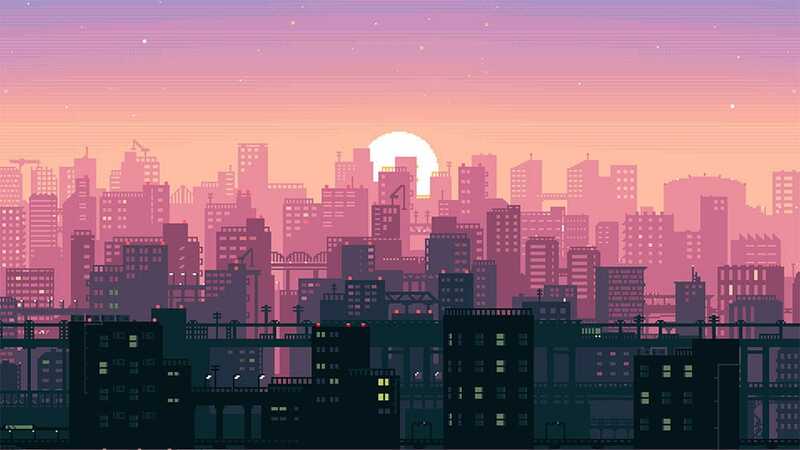 A week after my email announcing this website went into spam for most people, I sent out another, letting people know about a new live case study I’m starting. I changed my sender email address to see if would help, and this time “only” had a 25% drop in opens, but still received reports from people that my emails were no longer arriving in their inbox. Take Ricky for example, who had my last two emails go straight to his spam folder. Ricky has been receiving emails from me for years without issue, yet in the last two weeks that suddenly changed. Having people want to receiving emails from me is a privilege, but it’s really disheartening when those people can’t see the messages I send. I’ve built my audience up over the last seven years, only sending one or two emails per month, and always trying to provide value. In other words, I don’t spam my ‘list’ and never send emails which are inconsistent with why someone joined my newsletters in the first place. I know it sounds terrible to be “pleased” about the misfortunes of others, but two days ago a Twitter user named Kirill let me know I’m not the only person this is happening to. I was relieved to discover that others with newsletters were having similar troubles very recently. I was relieved simply because there might be some other explanation as to why this was happening, rather than some huge mistake (or misfortune) on my end. 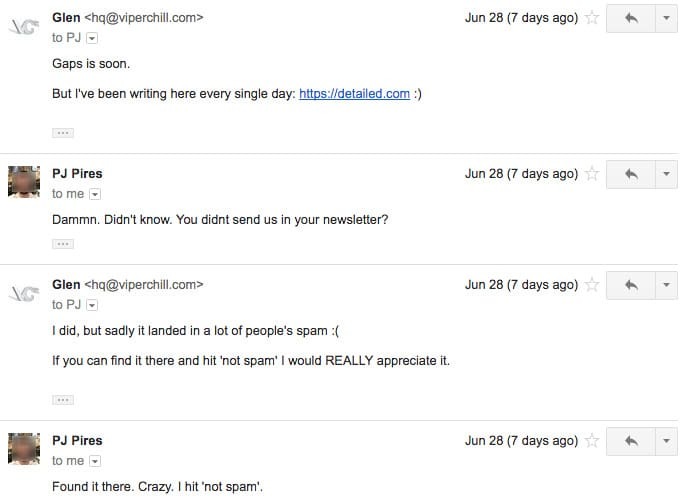 One example newsletter with the same issue, Farnam Street, had to send out an email explaining to their users they had no idea why their previous email had landed in spam for thousands of people. Hundreds of which had notified the sites owner, Shane. When I got in touch with Shane privately, he confirmed that this issue is still happening on the emails he sends and it only started in the past few weeks. The same thing happened to Noah Kagan’s recent emails. Noah initially chalked it down to the fact that his email list had grown in recent weeks. My own subscriber growth has been fairly consistent, so that didn’t explain my own issues. After asking if other people had experienced the same problem, I received a few similar concerns. To be objective about my belief that Google have changed something, I should add that around five people said they hadn’t experienced any drops. I would expect a change that hurt some newsletter owners would have hurt all of them, but my partial aim in writing this post is to find others with the same issue. I privately reached out to another newsletter owner I consider a friend, Paul Jarvis. His open rate has dropped by 25%, which is a big deal when you have thousands of subscribers. 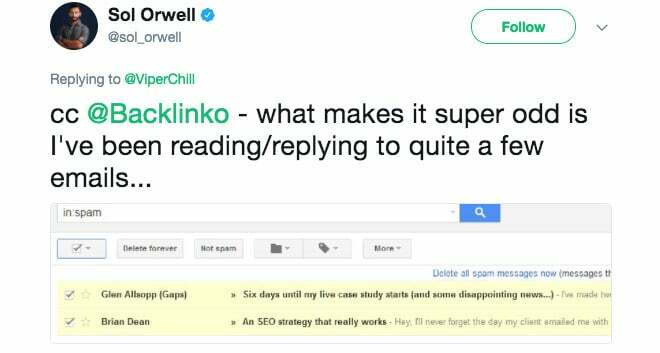 His reply added more fuel to my new theory that Google are now marking emails as spam that people genuinely want to receive. That last statement is important. I wasn’t just landing in the spambox of new subscribers, but people I had chatted with on a number of occasions. To be clear, I am aware of many reasons that emails wouldn’t get delivered. I had a lot of people tell me that their email open rates were now much lower (Thanks, Luke) but that could just be natural. Some people just don’t want to receive your emails anymore. Google have a promotions tab where…promotions go. You send out something that your audience aren’t interested in. And it’s just generally understood that people who sign up for something might not care about that something not long later. That said, I was receiving notices from people who have received emails from me for years without issue, now saying that nothing is coming into their inbox. It can’t be a coincidence that other people with active lists are seeing the same problem at the same time. This problem appears to be so bad for me right now that even normal conversions I have with people are ending up in their spam folder. It’s entirely possible this was a coincidence, but the timing is peculiar. I don’t ever recall having a reply in the middle of an email thread be marked as spam. I’m not just writing this blog post to complain that my emails are no longer reaching the people I want them to. I think there are enough examples of this suddenly happening to other people that Google has changed something on their side, and it would be great to get their attention if that’s the case. Dear Google, Is There Anyone Who Can Look Into This? While this post is primarily written to let my readers know they may have to mark my emails as ‘not spam’ and to find other newsletter owners with the same issue, I would love to get the attention of someone who works at Gmail who could look into this. I know they have better things to do than look into individual situations, but since learning I’m not alone with this problem, there are potentially millions of people no longer receiving emails they wish to receive. I do have a possible theory as to why this just started happening. My deliverability issues started around the same time I noticed this new ‘feature’ in Gmail which makes it clear that the person you’re replying to might not be the person you think they are. I can’t always predict when it will show, but when it does, it looks something like this. Maybe this is only new for me, but I’ve never seen it until recently. With many reports of people falling for phishing issues during the recent US Presidential Election, I imagine this is their way of helping to counteract similar problems in the future. If so, it’s possible it’s been too effective. Whatever filters are now in place have been potentially ‘tweaked’ too far that genuine emails, to people who genuinely wish to receive them, are no longer being delivered. I shared this theory in private with my friend Derek, who has seen similar huge drops in opens this year, and he thinks it has merit. Googlers, if you’re listening, please allow me to give one more example of why I think something is broken. PJ Pires (Hey PJ!) is one of many people who have been following my content for years. Most of the time I send something out, I’ll find PJ giving me his thoughts, which you can see in the ‘RE:’ of the subject lines below. PJ is always super positive so it’s always great to get his feedback on what I’m working on. Sadly, PJ is yet another person who has no idea I’ve been sending any emails recently. Here’s how the rest of our conversion went. Again, I totally understand there are many reasons why an email might go to spam. People click the button by mistake. You share a link which has been used for spam in the past. You mess up your SPF sender records which confuses everything. But surely when emails are no longer reaching people who have been replying to you for more than 18 months, at the same time that other newsletter owners are experiencing the exact same issue, there’s cause for concern? 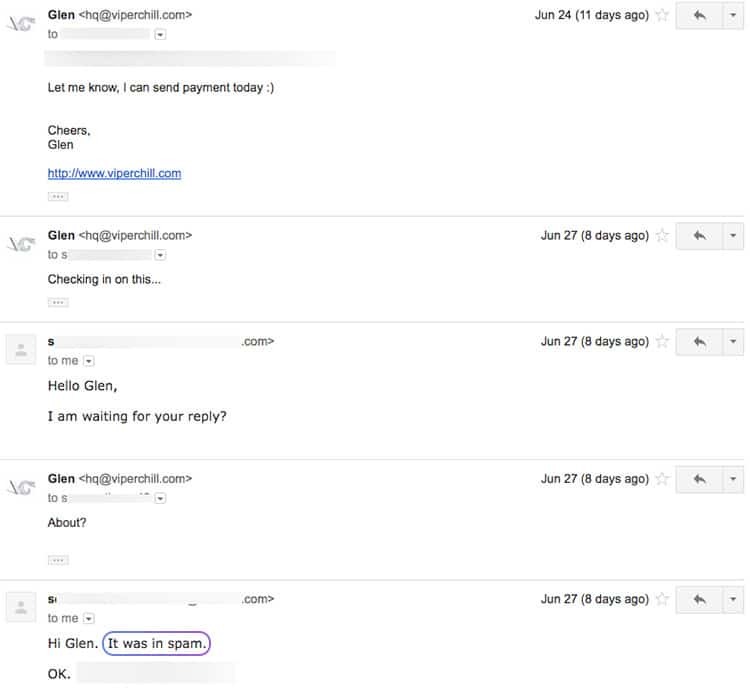 I don’t expect anyone from the Gmail team to look into this. 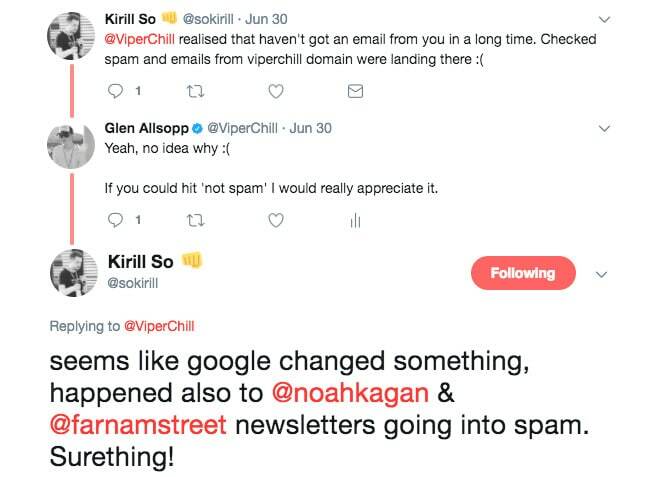 As I said, I appreciate that you’re incredibly busy to look into things, but if there’s any chance someone from Google is reading this, my email address is hq@viperchill.com. I would really appreciate a response, and will happily offer advice to others if you can share your findings or recommendations. If you haven’t seen any emails from me recently, please search for hq@viperchill.com in your inbox. It’s very possible my recent emails have been marked as spam. If that’s the case for you, and you would still like to hear from me, please click the ‘Not Spam’ button which Gmail provides. 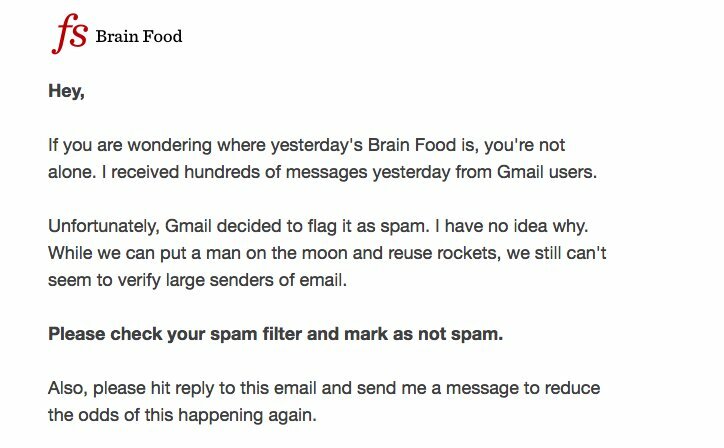 I don’t know if it will help based on Gmail’s seemingly new filtering rules, but it’s worth a shot. I’m a big advocate of never having your marketing eggs in one basket, so I’m fortunate to have a fairly large following on platforms like Facebook and Twitter where I can still reach people who visit my sites and enjoy my content. While there’s nothing more important to me (marketing-wise) than having people want to receive my emails, I have never expected a 100% open-rate or ignored other channels. All I’m hoping to happen is that the people who want to hear from me, can and do. First of all, if you’ve experienced a big drop in open rates – specifically in the last two weeks – I would love to hear from you. You can reach me at hq@viperchill.com. If you’ve read every word in this post, then you’ll know there are many reasons why an email might be flagged as spam. Google has their own documentation on why this might happen. If you’re experiencing issues, it could be completely unrelated to anything I’m writing about here. The only way I slightly reversed my open rate drop was to send emails from another email address. Luckily there is quite a strong overlap in two of my email lists (which require opt-in confirmation) which many people have already confirmed that they should receive a message from two places. You are welcome to try this as well, but I would conduct some tests, first. I’d create a segment of just a few test addresses of yours (maybe create one for Hotmail, one for Gmail, one for Yahoo, etc.) to make sure this doesn’t radically change your results for the worse. Before making any switch in this permanently, make sure to send out one last email to your subscribers with the current From Address to prepare them for this. I also asked about whether I should change the server in which my domain is hosted, even though it’s clean when checking it through a spam report service. You are more than welcome to try this, sure. Not the most thorough reply, but it seems like it could have some effect. Before following any of my steps, be sure to contact your own email service provider to see if they have any advice. I really tried to ensure this post wasn’t just a personal cry for help, using ‘my reach’ to get personal attention, but as I recently discovered I’m not alone with this issue, I would appreciate if you could share it with others who may be in the same boat. I’ve received a lot of emails from other people in the same boat since this went live. Here I’m sharing just a small sample of them. Brian Dean from Backlinko has over 100,000 email subscribers and after sharing his numbers with me personally, his open rates have suddently dropped quite a lot. Sol Orwell is one of many people who tweeted to say that mine and Brian’s emails (which he actually wants to receive) are now ending up in spam. I know that many of my examples here are in the marketing space but that’s because I have an audience of marketers. But please keep in mind that Farnam street (up top) were hit pretty hard with this ‘update’ and they have nothing to do with marketing. David, who runs a large stock photo website, has seen his open rates take quite a hit as well. Shane just sent out a tweet about what we reported above. His open rate has dropped by around 30% in the last two weeks. As Shane points out, this seems to be a Google-only problem. We share content marketing case studies you can actually use, seven days per week.